In 1974, Kathy and Christine travelled across the Atlantic to see Elvis perform at The Hilton, Las Vegas. Dressed in matching white and navy blue evening dresses, the girls managed to charm their way right to the front of the stage meaning they were only inches away from Elvis! After the show, the girls decided to head back to their room when another familiar face joined them in the elevator. “We recognised him immediately from the photos we had seen in the fan club, we were in the lift with Vernon Presley, Elvis’s Dad! He said to us “What are two pretty, little girls like you doing so far away from home?” he couldn’t believe that we had come so far by away by ourselves to see Elvis”, said Christine. Kathy added; “I would like to say a special thank you to Jan because she is an angel too. She goes above and beyond to help me spend time with my sister. Some people may think this is only a little thing, but it makes such a big difference to us. To be kind is one of the most powerful things anyone can do”. The Rowcroft Inpatient Unit provides a special space for reminiscing and creating new memories. Christine and Kathy have been supported by Rowcroft for the past two years. Kathy said, “The nurses at Rowcroft are amazing, they are all angels. One nurse, Karenne, we actually call the angel of the south – you couldn’t find better care anywhere.” Karenne Weaver is a community palliative care team member who has supported the twins for the past two years through home visits. 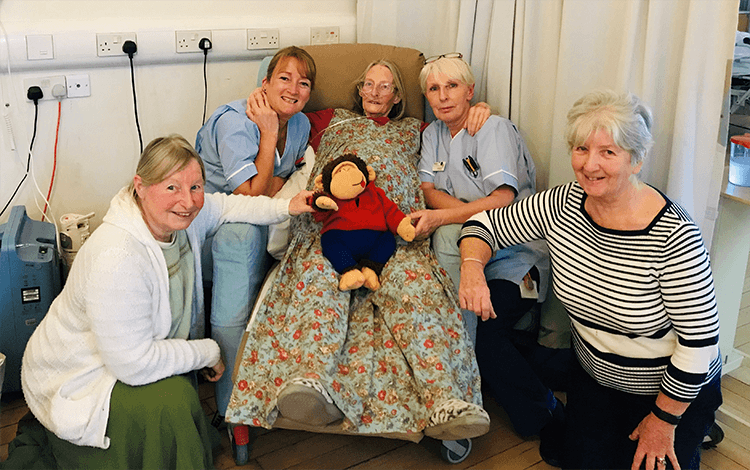 Rowcroft’s approach to patient-centred care has provided Christine with a bespoke level of care at home through occupational therapy as well as symptom management. The community palliative care team as a whole have supported the sisters together through emotional support and music therapy. This is just one example of what makes hospice care so unique; in addition to physical care, patients emotional, spiritual and psychological needs are also supported. Rowcroft is committed to helping patients and families living with life limiting illness across South Devon access patient-centred care to improve quality of life and share precious moments together.